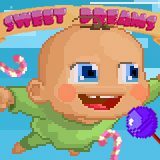 In this nice puzzle game you should group different sweet things into rows to clear the play field. Earn as much score as you can and enjoy! A game for true puzzle lovers.